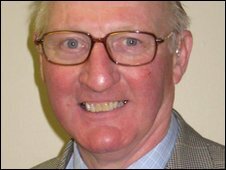 A councillor has been partially suspended and told to issue a formal apology after he made racist comments at a public meeting in Lancashire. Pendle Borough councillor Smith Benson made the remark at a meeting in Colne last year. He later apologised. He was called before the authority's standards committee on Wednesday. It found he had "failed to treat others with respect" and that "his conduct had brought his office of councillor and the council into disrepute." At a meeting of the Colne town centre regeneration forum last September, Mr Benson, a Conservative councillor, said: "The problem with Colne is that there are too many takeaways. And too many Pakis, that's why people don't come to Colne." Liberal Democrat councillor Tony Greaves complained and a leading council official compiled a report which found the comments breached the code. The standards committee has upheld that finding. Philip Mousdale, an executive director at Pendle Council, said: "He (Mr Benson) has been partially suspended until he attends training on equalities legislation. He is also required to issue a written public apology. "We expect that these will happen within the next week." Mr Benson said he accepted the findings of the committee.